Everyone has stress. It’s a natural thing to experience throughout life. In fact, a 2015 study from the American Psychological Association found that the average stress levels in the U.S. are a 5.1 on a 10-point stress scale and 24% of American adults admit experiencing “extreme stress.” That’s a lot of our friends, family and co-workers experiencing stress, but what does this have to do with your teeth? Fact of the matter is, an awful lot. You probably already know what stress can do to your body and the damaging side effects — but what about your oral health? Keep reading to learn the effects of stress on your teeth. Our mouths have just as much of a chance of being plagued by the side effects of stress as any other part of our body. Research has found there there are links to oral health and stress, meaning that stress is a contributing factor to the condition of your teeth. From clenching your jaw, to grinding your teeth — there are plenty of ways stress can wreak havoc on your mouth. Bruxism — Bruxism is another term for grinding your teeth or clenching the jaw. Stress is one of the leading factors in Bruxism, and often times you aren’t even aware you’re doing it. Bruxism occurs during sleep, while you concentrate, or when you’re the most stressed out. Signs of teeth grinding or clenching include: worn away tooth enamel, tooth sensitivity, an indentation on your tongue, and teeth that appear worn down. Canker sores — Canker sores have been linked to stress. People who bite the inside of their cheek, brush too hard, or eat foods that are high in sodium are at risk for canker sores, but those who add stress to the mix greatly increase their chances. Dry mouth — Dry mouth occurs when the mouth doesn’t produce enough saliva. And when the mouth doesn’t produce enough saliva, it’s a breeding ground for bacteria. Because stress inhibits saliva production, dry mouth can occur. TMJ/TMD — TMJ and TMD, which both involve the joints and gums, are one of the most common oral problems related to stress. A clenched jaw can trigger TMD or TMJ if repeated regularly over time. This can greatly impact your overall health. Signs and symptoms include: pain, popping and/or clicking when you use your jaw, and your jaw locking into one place. Gum disease — Gum disease has been linked by dentists to stress and negative emotions. When you’re stressed out, your body produces more cortisol, which increases inflammation in the gums and increases the chances for gum disease. 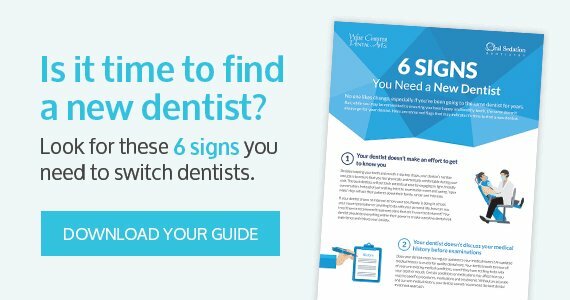 Find out what’s right for you, and as always, talk to a comprehensive dentist, like West Chester Dental Arts for more tips on how to de-stress and ways to care for your oral health to keep your smile healthy, beautiful and stress-free!